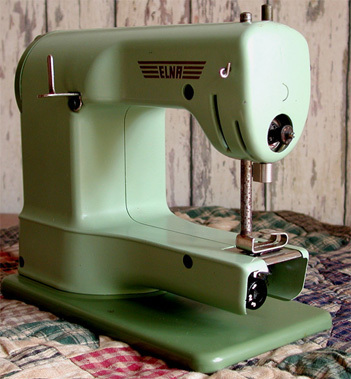 Elizabeth discovered this Elna Junior Sewing Machine in the I-70 Antique Mall in Springfield, Ohio. 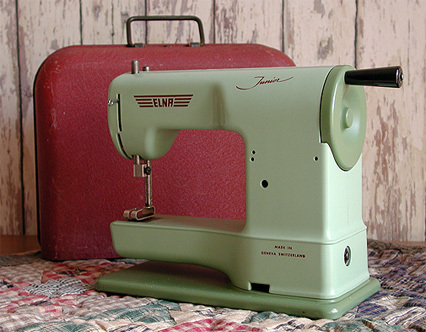 She quickly pointed it out to jim knowing his affection for Elna sewing machines. This is the first (and only) child's or Junior Elna we had ever seen. As such, we knew nothing about the Junior. Jim turned the hand crank and the needle bar went up and down and the thing that makes the chain-stitches on the base went around so we figured that was all that needed to happen. It even came with the tin case which we knew was a plus. In our haste and excitement we grabbed it, paid a whole lot more for it that it is worth, and left. Upon arriving home and looking at the machine more closely we discovered that the lever which raises the presser foot is missing. The presser foot can be raised by hand, however. Also, a check on the internet suggests that some Elna Juniors have a music box in the machine which this one does not have. The music box apparently plays "Blue Danube Waltz" when a key is wound. The larger hole in the tower should have a key for winding the music box. The key is a round ring which can be folded against the machine. A rectangular hole on the base is for a clamp which attaches the machine to a table top.